Numbers is one of several of my new books and chapbooks that are collage-poems or collage with matching poems. Numbers features poems and facing page collages in color. There are forty-five poems and matching collages. 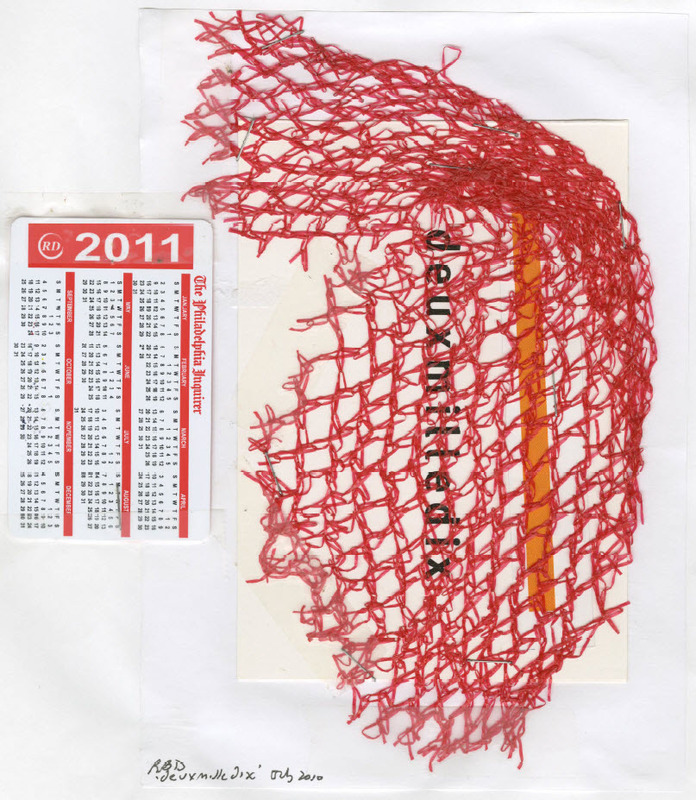 This new work, with collages composed between 2010 and 2015, concerns the numbers one through five with π in its appropriate place between three and four. Like a good deal of my work, it concerns cosmological mystery – both π and numbers have plenty of that – along with meditations on the nature of our lives. In part, these meditations try to fill numbers with the same interesting ambiguities as words. That’s at least one theme. Another is imperfection – π, as you know, is an irrational number and no one has yet found it to repeat, though people have tried out to more than a trillion places. Yet the circle – whose circumference is calculated using a ratio of π – is a ‘perfect’ geometric figure. These poems go into that gap between the perfect / complete and the imperfect / continuing and try to investigate. These are not the poems of a mathematician, just a person. The poems are gnomic, playful, direct, meta-numerical and meditative in about equal measure. The collages are – how to describe such work? – abstract with a strong sense of color. They link directly to each of the poems without being illustrative. This work, as a whole, will be published in book form by Materialist Press, edited by Julia Warner and Ariel Reznikoff, in 2018. The Collage Poems of Drafts published two of the separate cantos in my long poem Drafts, works which were conceived as collage – ‘Draft 94: Mail Art’ and ‘Draft CX: Primer.’ Graphic Novella is a visual-text book of loosely political meditations in prose poems and poems matched with black and white collage. ‘Churning the Ocean of Milk,’ collage-poem chapbook from 2014, was done as a cosmological meditation after a visit to Cambodia with its chilling recent history of crimes against humanity – specifically, governmental genocide against its own people. It was published on line at Alligatorzine. A 2017 collage-poem book called Life in Handkerchiefs has appeared in on-line groups in periodicals such as Journal of Poetics Research and Alligatorzine. Other collage poem series are Storyboard, Old News and 13 R AY S. My most recent book of poems, Days and Works also features unaltered newspaper clippings as part of its text. This entry was posted in CHAPBOOKS and tagged Rachel Blau DuPlessis. Bookmark the permalink. Rachel Blau DuPlessis poet, critic, collagist, is the author of the multi-volume long poem Drafts, (1986-2012), from Salt Publishing and Wesleyan, called ‘one of the major poetic achievements of our time’ by Ron Silliman. Post-Drafts books include Interstices, Graphic Novella, Days and Works and both the collage-poem Numbers and Around the Day in 80 Worlds, both slated for 2018. She has written a trilogy of critical essays on gender and poetics, The Pink Guitar, Blue Studios and Purple Passages, and several other critical books. She has edited the Selected Letters of George Oppen, a collective memoir The Oppens Remembered, coedited The Objectivist Nexus and has written on Oppen, Zukofsky and Niedecker. Also published in 2017 was Selected Poems/Poesie scelte, 1978-2015, translated into Italian by Anny Ballardini.